The BMW M4 is among the most impressive cars available at AMT Leasing. With a 3.0-litre twin-turbo engine generating over 400bhp, and plenty of technological adjustments like automatic stability control and dynamic traction control, few cars in its class handle better. The interior is stylishly modern, with electrically heated and fully adjustable sports seats giving you total control of your driving position and comfort. We offer both the coupé and the convertible BMW M4, with plenty of optional extras available for each. You can find our BMW M4 lease cars among our other BMW lease deals today. 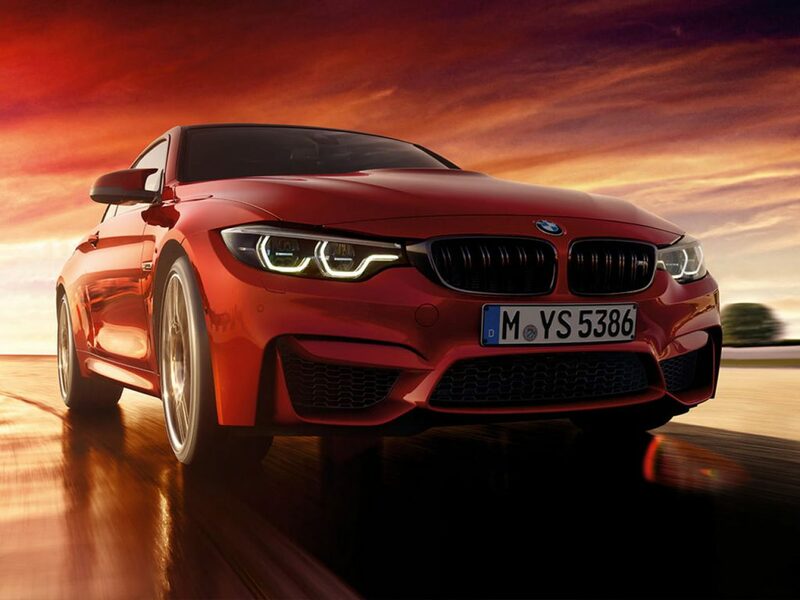 Why lease the BMW M4? With both breath-taking BMW M4 coupe and convertible models available, all you really need to decide is how thrilling you want your journey. If you’re thinking this model is a straightforward replacement for the departed M3, you’d be wrong. The exhilarating engine is not only more powerful, it’s cleaner and more efficient too. The styling is simply superb, offering a truly beautiful, refined BMW from the M Division. And it’s not just enjoyable to look at - it’s racing capability demands respect, even from the supercar clientele. Let’s start with the efficient 425bhp engine, which is a twin-turbo, 3.0-litre, six-cylinder magnificent beast. The rear wheel drive delivers responsive handling to manage all that power, making for a ridiculously fast car that’s effortless to drive. The acceleration features a rocket-like launch to reach 62mph in just 4.1 seconds, and in fourth gear you’ll race from 30mph to 70mph in 5.4 seconds. With that and a choice of 3 driving modes, you can choose how hard you want to drive. Naturally, this level of performance is backed up with M Compound brakes as standard, as well as Adaptive M suspension that automatically adjusts the car to different driving conditions. Adaptive dampers add to the solid ride and offer support when understeer is virtually impossible. The convertible boasts a hardtop roof and when driven in Comfort mode, offers an enjoyable and relaxing cruise that is guaranteed to make other drivers jealous. The coupe benefits from lower CO2 emissions than most models in the same class, which is sure to appeal to company car drivers. For many, the M4 is unbeatable in design. Long, sleek and muscular, it’s a veritable athlete among cars, with its flared wheel arches and large air inlets adding to the eye-popping appeal. With 19-inch alloys as standard and the coveted M badges, the M4 is hard to miss. Inside the cockpit, the low-slung seat with inflatable side makes for an enjoyable ride, even on bumpy surfaces. The upgraded technology consists of an innovative iDrive system shown in windscreen on an 8.8-inch display, a Professional Media sat nav and the intuitive BMW Connected Drive. The Driver Assistance systems are designed to make the most of the safety features in your BMW M4, as well as offering enhanced visibility and improved parking. The unmistakable M styling doesn’t end on the outside, with the interior featuring a beautiful leather steering wheel, sports-style gearshift paddles, M designed instrument display and of course the aluminium, emblazoned door sill finishers. Both the coupe and convertible offer performance and practicality, with two comfortable rear seats ensuring generous legroom. If you need more room, there’s a larger boot space available in the coupe. At AMT Leasing, we offer a range of BMW cars to lease as well as the M4. Simply chat with our leasing experts online or browse the comprehensive range today to find a BMW finance deal that suits you. If you like the BMW M4, then why not take a look at the BMW X5 or the Mercedes-Benz GLC Coupe.